As usual, most of my posts are inspired by customer requests (I don’t sit at home thinking up scenarios to blog about regardless of what my wife thinks! ), and this one turned out to be surprisingly easy to resolve, even though I initially went about it the wrong way. 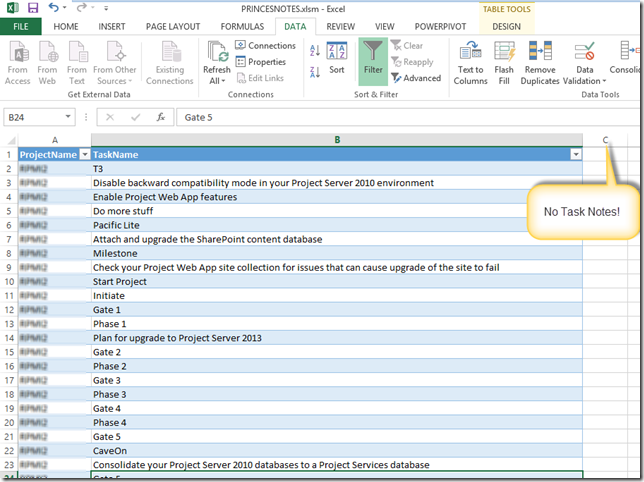 The request was fairly simple, to show the contents of any task notes fields in an Excel report, alongside other task data. I know from past experience that the Notes field is not part of the reporting database, and that the information is held as binary data. So this means accessing the published tables (in 2013) or the published database (in 2010). 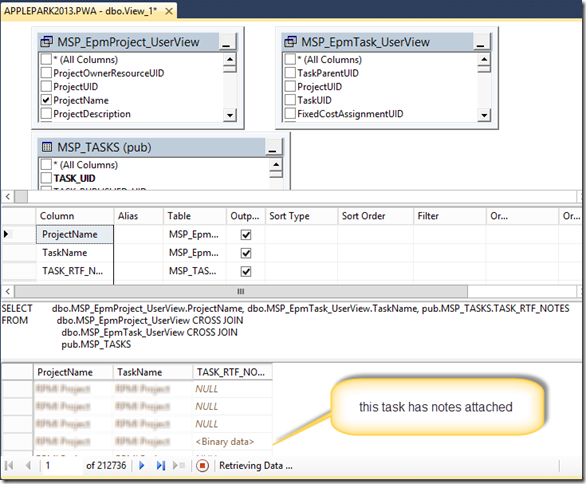 The Notes field exists in the pub.MSP_TASKS.TASK_RTF_NOTES table. 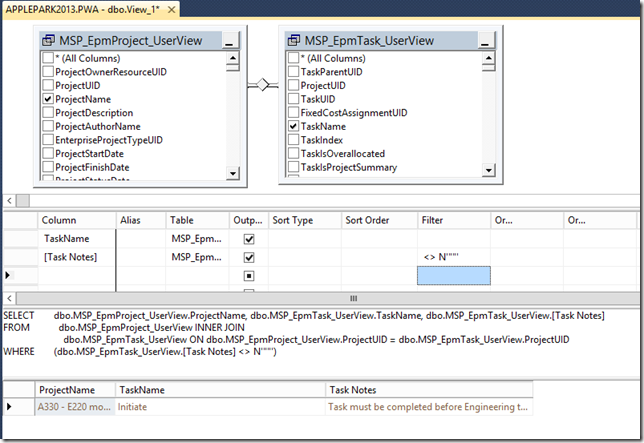 Here’s a brief view of the select statement – please note that this search all rows so ideally you’d want to check whether the TASK_RTF_NOTES field is null or not. 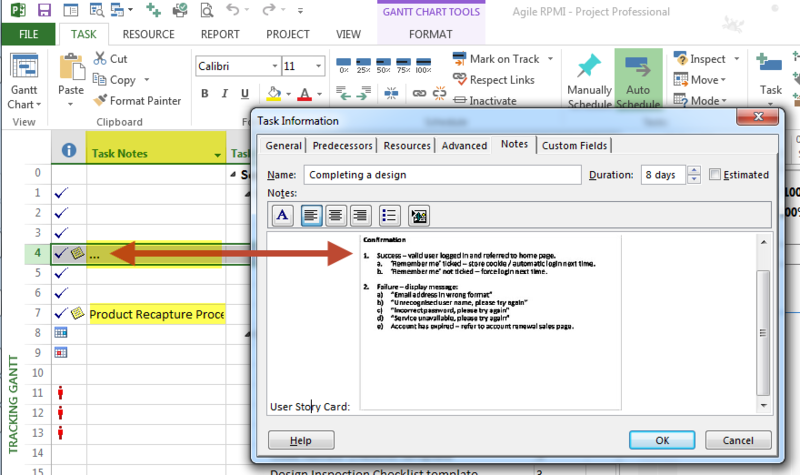 If I pull this data into Excel using a data connection, I get the Project Name and the Task Name, but not the Notes field (fair enough I think, it’s not a text field). 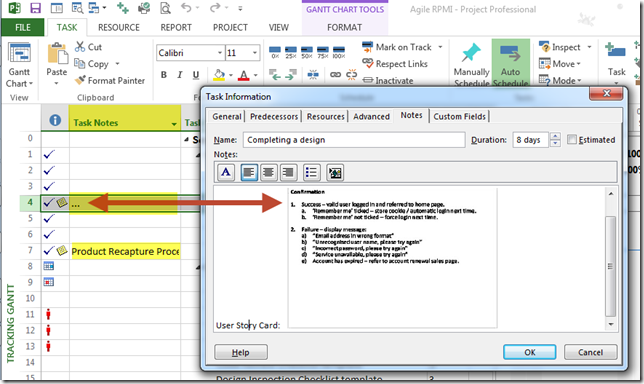 'to a file that can be opened with Microsoft Word or displayed in a richedit control. 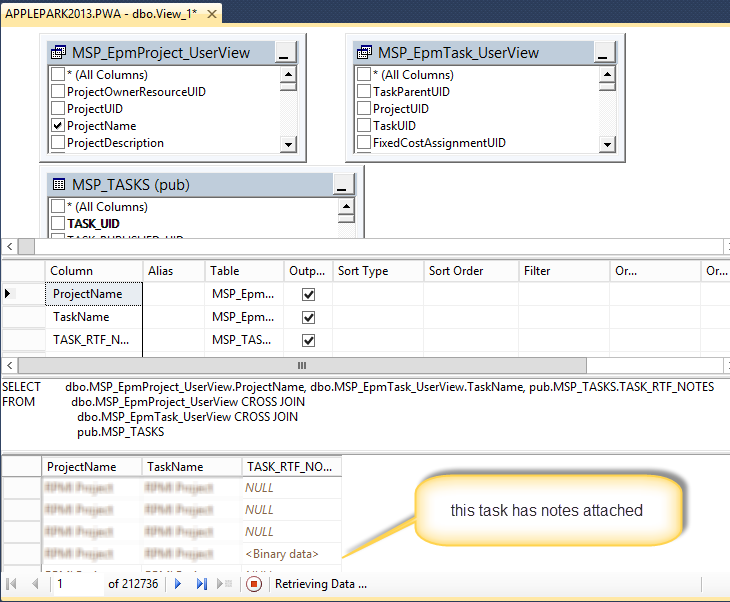 sql = "select PROJ_ID, TASK_UID, TASK_RTF_NOTES " & _ "from MSP_TASKS " & _ "where TASK_RTF_NOTES is not null"
We created a Project Server Task Level ECF called Task Notes, with the formula = [Notes]. 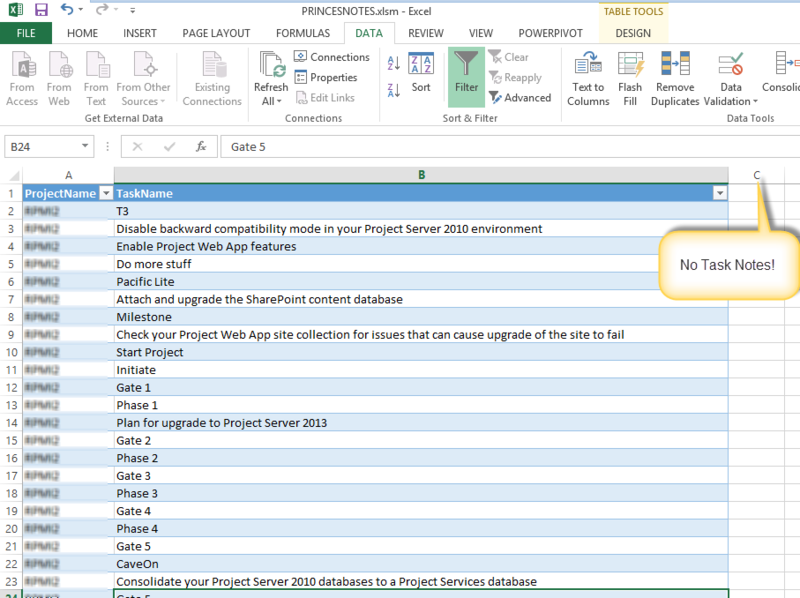 This brings in the 1st 255 characters of the notes field into the Excel report, and doesn’t break Microsoft’s policy of only accessing the reporting database. And of course, when you view this field in Project, it shows 255 characters of the Notes field. If the notes field contains not character items, then … is displayed as can be seen from the following screen shot. So, kudos must go to Brian Kennemer (http://www.projectified.com/) for his inspiration.